Could the Amazon Echo become the first voice-controlled console? Welcome to the new age of gaming. Our days of sitting in front of the TV, controller in hand might not be numbered – that core gaming experience will still exist – but they could soon be heavily reduced. The types of games we play are always evolving, but now, more than ever, where and how we play them is changing too. We're not just talking about the growth of mobile titles, the recent introduction of the Nintendo Switch or the inescapable rise of VR though – we could all be about to put down our consoles, controllers and headsets, and instead turn the world around us into a game, using our voices. Confused? Don’t be. The Amazon Echo, the online giant’s connected smart speaker that's taken US and UK homes by storm, is getting in on the gaming act. With the firm’s brilliant digital assistant, Alexa, at its core, Amazon is building on the Echo’s entertainment efforts, taking the device beyond its ability to control everything from your heating and lighting to your taxi requests and pizza orders with just a vocal cue. The first voice-controlled Alexa games having started to drop – and experts have suggested that this is just the start. “As the technology grows, and Alexa has a greater capacity to learn from the user, the games and experiences that Echo can provide will get a lot more complex, deeper and a lot more specific to the user,” says Mark Ogilvie, Design Director for RuneScape. While voice elements within the gaming realm are nothing new, they're usually limited to devices, rather than the games themselves – you can, for example, turn your Xbox One on and off, and eject disks, using voice commands. Alexa and the Amazon Echo (not forgetting the Amazon Echo Dot) are changing this, however, putting vocal cues front and centre; however, well as opening up vast new channels of gaming possibilities, this also creates its own challenges for game developers. “Usually you’re trying to assault all the senses of your player. You’re trying to give them a deeply engaging visual experience, and that’s something that wasn’t on offer to us here,” Ogilvie, who brought RuneScape, the world's largest MMORPG to the Echo, told us. Despite these new challenges, Ogilvie predicts that the possibilities for vocal gaming brought on by the connected Echo will ultimately outweigh the negatives, and we’ll see a widespread rise in voice-activated games. 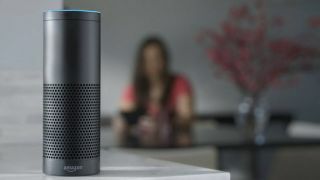 Fortunately, Amazon is getting on board, and in a big way, confirming to TechRadar that it not only sees gaming as a viable future for the Echo and Alexa, but that it's actively working with developers to accelerate its evolution. “We’ve seen a ton of activity around games and the way people are looking to get more entertainment with Alexa,” Daren Gill, head of Alexa product development at Amazon, told us. “We look at mobile apps, how games could be incorporated into the small screen, and now we’re looking into the future at how using voice and a voice interface could open up new experiences.